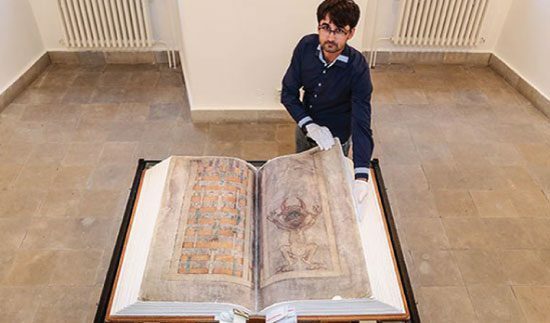 A book called the Codex Gigas is the largest and the strangest manuscript in the world. Its creation and history are steeped in a mystery that incorporates the mundane and the arcane, heaven and the inferno. Its immense size (3 feet in height by 3 feet in length, when opened) has given it the name Codex Gigas. Gigas is Latin for giant, so its name literally means Giant Book. That’s quite accurate, since two people are required just to lift it and the leather it’s been made with came from no less than of 160 animals. 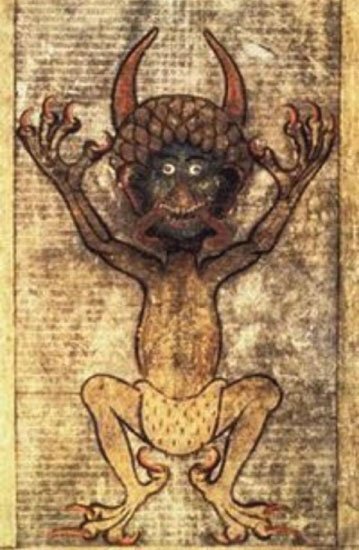 According to the legends surrounding it, the Codex Gigas was spawned as a result of a pact with the ‘devil’ and that is why it’s also known as the Devil’s Bible. Most historians agree it was created in the early 12th century in the benedictine monastery of Podlažice in Bohemia, now located in the Czech Republic. Stories of the past say the manuscript was written over the course of just one night by a monk whose execution was set to happen the following morning. Against the harsh rules of his monastery, the monk had been exploring the occult and demonic arts. When his transgressions were discovered, the abbot was quickly sentenced to death by being walled up alive. In his last night on this earth, the unnamed monk made a pact with Beelzebub himself and offered his immortal soul in exchange for a chance to finish his chef d’oeuvre. Although he planned to offer the book to the monastery in exchange for his life, the occult nature of his dealings still brought his demise. 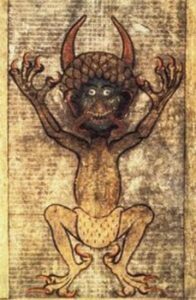 Its alleged demonic origins have spun a large number of stories around the Devil’s Bible, all of them revolving around the same plot: the Codex brings calamity and sorrow to whoever owned it. This is one of those books that possesses its owner, and not the other way around. The Codex Gigas first saw the world outside monastery walls when the Benedictine establishment that housed it came into financial troubles. It was sold to another monastery near Prague and after only a few years, it brought the dissolution of this second abbey. Shortly after that, the manuscript came into the possession of the Holy Roman Emperor Rudolf, who became obsessed with it. Surrounding himself by other occult tomes, Rudolf descended on a road to madness and paranoia, forcing his family to strip him of his crown and banish him. The manuscript was acquired by the Swedish army as a spoil of war in 1648. The Codex Gigas contains all the books of the Latin Vulgate Bible and five other texts. Intriguingly, the Old and New Testaments are disconnected and not presented in the order we’re accustomed to. The other texts are interspersed in between the religious ones. Among these writings is a version of Flavius Josephus’ Antiquities of the Jews, along with Isidore of Seville’s Encyclopedia Etymologiae and medical works attributed to Hippocrates. Also included in the Codex are a number of smaller texts and annotations containing various formulas and incantations. There are also notes on several practices of exorcism, cures for mysterious illnesses and methods of protecting one’s soul. Alongside depictions of the Heavenly City and the Pearly Gates there is an entire full-page illustration of the Devil that is probably responsible for a lot of myths surrounding the Devil’s Bible. In any case, that is certainly how it got its name; it’s the only Bible with a large image of the evil incarnate inside its pages. The stories around the Codex Gigas are entertaining but book experts are unconvinced of their veracity. They say the book was probably handwritten and painstakingly illustrated by a single monk over the course of 25-30 years. The fact that the writing is consistent throughout the entirety of the manuscript is probably what gave rise to the legend that it was written in a single night. While its origins are unclear and coated with a thick layer of mysticism, the Codex Gigas continues to fascinate those who lay their eyes upon it. You can too, as the manuscript is now on display at the National Library in Stockholm, where it can be viewed by anyone.